Xitang is an ancient scenic town in Jiashan County, Zhejiang Province, China. It is a water town divided into nine rivers. The town stretches across eight sections, which are linked by many old stone bridges. Every family lives near water. It is among the best water towns near Shanghai. I visited in Xitang in October, the month with the best weather and clear sky in Shanghai and its surroundings. In order to enjoy the night scenes and catch the sunrise views, I booked a hotel in the middle of the town. The hotel locates in the town centre and it is convenient to see the town without any hustle. It was already after dinner time, around 10:00 o’clock in the night, but there are still quite a lot of tourists strolling around. All the shops were still open and ready to greet every customer. To help your orientation, there is a digital street map on the wall. It clearly displays the street names in the darkness. There are 122 lanes in the town. Among them, the ShiPi Lane (石皮弄) is the narrowest one. The widest part is s 110cm but the narrow lest part is 80cm. Though it was already late, the owners of small eateries still tried to sell the food as if everyone was still looking for dinner. Some owners were making fresh food using very simple facilities. I wonder if they could sell any. However, when I looked at those snacks, I had my appetite back. After a while, I had two packs of food in my hands. A typical sweet cake is the chewy Qianshigao (芡实糕), a thinly sliced gorging fruitcake. A typical traditional dish is made from pork with sweet vegetables (霉干菜扣肉 Mei Gan Cai Kou Rou). You can find it in some family-run eateries. The shops offer a variety of local products. From handmade shoes, mobile phone covers, self-made Chinese rice wines, and of course hundreds of snacks and takeaway food. Some souvenirs are expansive than elsewhere. But the price of those freshly made food is very reasonable. Houses along the waterways are lit by many red lanterns. The clear reflection of the lanterns in the water dominated the night scenes. Standing on one of those bridges, the scenes were so tranquil. It’s so beautiful. There are hardly any street lights. At some places, the red lanterns work as the street lamps. This also creates an exotic street scene. There is a street dotted with bars and discotheques. They open until around 3:00 in the early morning, according to one owner. This is also the most lively corner of the water town in the night. There is no entrance ticket required for the discotheques, but the food and the drinks inside the nightclubs are expensive. I didn’t visit any because outside the night scenes were more attractive to me. I walked into this architectural garden. It was the biggest private garden in Xitang. Everywhere the lanterns illuminated the garden. But I still pay extra caution to those stone stairs. Pond, pavilion, small hill etc, it has some basic elements a Chinese traditional garden should have. The red lanterns add a mysterious atmosphere to the scene. I followed the route and walked out of the back of the estate. The West Garden used to belong to a wealthy family in the Ming Dynasty. Today’s garden had been rebuilt in 1993. It was midnight when I returned to my hotel. Longing to see the sunrise views in Xitang, I couldn’t sleep until I was really tired. Then my alarm clock shouted loudly. I set the alarm half an hour earlier than the sunrise time. So I had enough time to look for a place for taking photos. Surprisingly, there were so many early birds out there. Most had their cameras and tripods ready to capture the scenes. I stood on The Bridge of Tangdong St. and settled myself in a nice position. At the end of the water canal and behind the morning must the sun rose lazily. The air was quite humid, but fresh. I managed to capture the scene using my iPhone before the sun moved out of my view. In old times, to cope with Rainy days, residents have invented their own style of the covered corridor. Each family puts a ceiling over the cobbled stone road in front of its own house, and the ceilings connect with each other to form corridors. Nowadays, the covered corridors are the main places for outdoor activities and attract countless tourists. In “Mission Impossible III” some scenes were filmed here. I wanted to walk along corridors just like Tom Cruise did in the movie. After admiring the sunrise I went to the Long Covered Corridor, 1,300 metres, the most famous one and the longest one. There was no single tourist there yet. I enjoyed the silent moment and watched how locals started their day. 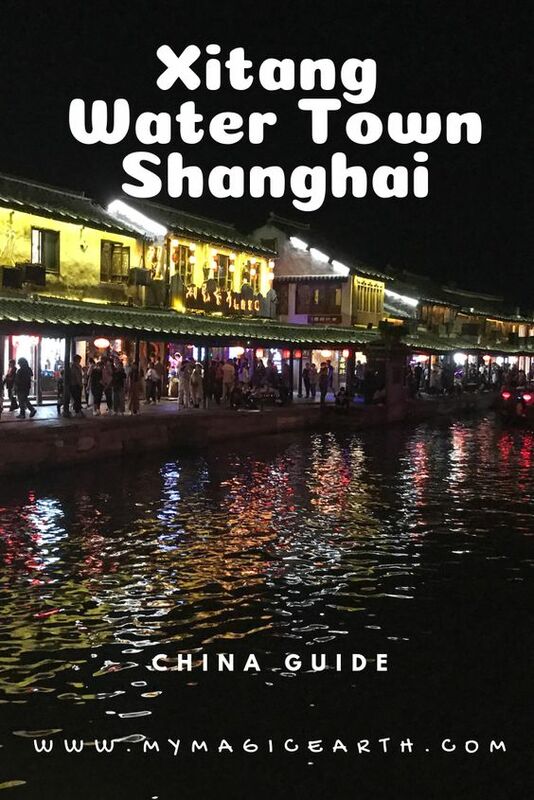 The tour Xitang Water Village Sunset Tour with Riverside Dining Experience has the very good review. It starts from Shanghai and will be back around 10:00 pm and includes hotel pickup and drop-off. During the day, you stroll around the cobbled streets, admire old buildings, cross bridges arching over canals. In the late afternoon, you can watch the rowing boats lingering on the river under a beautiful sunset. In the evening, you will enjoy a romantic night including dinner, see the sights illuminated at night. Inside the water town, there are only a few hotels which are mainly accommodated Chinese guests. The prices are reasonable. Outside the water town, there are a few hotels. I would suggest booking a room inside the water town because it is convenient to get access to the scenic area at any time of a day. The Xitang Yunxi Guest House(西塘云夕客栈) is close to the east gate of the scenic area. All rooms boast a TV with satellite channels and a private bathroom. The accommodation provides a 24-hour front desk and free WiFi. The rooms include a kettle, while some rooms are equipped with a terrace and others also offer lake views. And, it offers barbecue facilities and a garden. Each room equips with a seating area. It has a modern rustic style. From Shanghai Long-Distance Passenger Transport South Station (长途客运南站) or Shanghai Long-Distance Bus Station (长途汽车客运总站) there are many scheduled buses to go there. The ride is about 1 hour. What an awesome place! Magical, etheral. Must write the name to our notebook for future plans. Thank you for sharing this! You have such beautiful photos – especially that sunrise and the empty covered corridor. They really make me want to visit. I also love the way you share some small helpful details, like the fact that October is a good month to visit Shanghai. Super useful info.